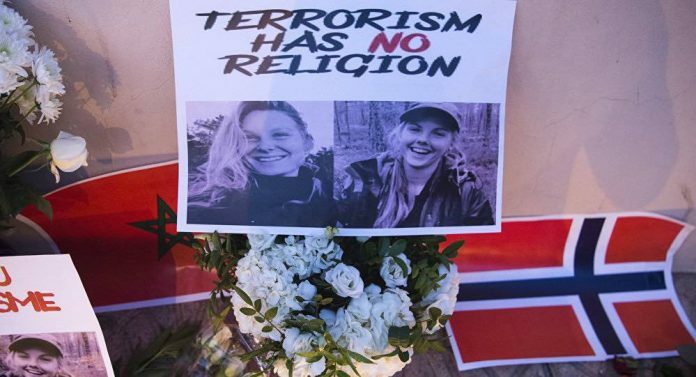 On Sunday, Moroccan authorities charged 15 people with terrorism violations over the beheading of two Scandinavian tourists, according to a report by Business Insider. The group of people was arrested as Moroccan police investigated the murders of Louisa Jespersen, 24, from Denmark, and Maren Ueland, 28, from Norway, a public prosecutor’s statement said. The women, who studied together at the University of South-Eastern Norway, were found decapitated in their tent on December 17, in a popular hiking area in the High Atlas Mountains. The tourists were on a month-long vacation to the region, Insider’s report says. The incident gained notoriety after a graphic video of one of the women being beheaded spread across the web. The authenticity of the video has reportedly been confirmed by Danish intelligence services. According to Moroccan authorities, the investigators discovered other videos, showing some of the arrested men openly pledging allegiance to Daesh, the terror group whose smaller cells have spread from Middle Eastern regions to Africa and Asia. Boubker Sabik, spokesman for Morocco’s national security agency, disclosed that the police stumbled upon a bomb-making operation during their investigation, which was possibly a part of a large-scale terror attack plan. Last week, Sabik also said that despite their show of allegiance to Daesh, the murderers were in fact “lone wolves,” selecting their targets at random and without guidance from the terror group. More charges may follow as the investigation continues, Business Insider quoted Moroccan prosecutors as saying. Are poinsettias or any other holiday plants poisonous?